A Taste of History with Joyce White: Christmas Fruitcake: It's Time for Americans to Get Over Their Fear and Loathing! Christmas Fruitcake: It's Time for Americans to Get Over Their Fear and Loathing! 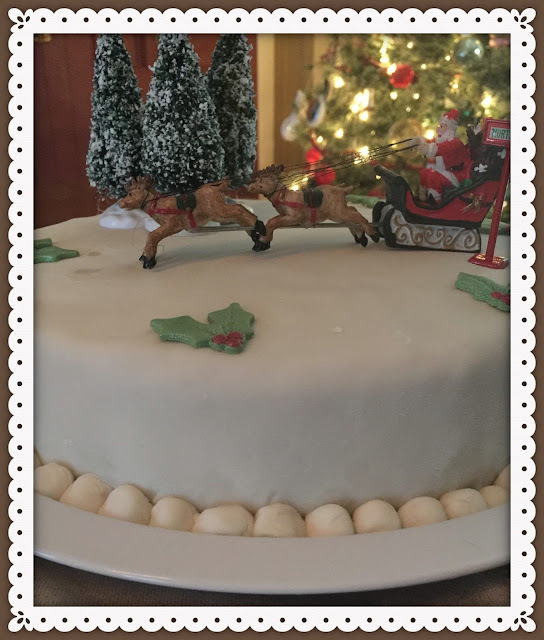 While I am sure there are many American bakers who turn out delicious fruitcakes at Christmas, lots of Americans, unfortunately, have an aversion to fruitcake. This negative view of the dreaded fruitcake is not helped by the drab commercially prepared cakes available in American supermarkets and wholesale clubs. These cakes tend to be dry, hard, and tasteless and have a poor texture. The fruits in these cakes tend not to be doused in tasty brandy or other spirits, and they are filled with artificially colored glazed cherries and citron. While visiting England over the 2014 Christmas festive season, I noticed beautiful Christmas fruitcakes available in almost every food shop and department store. Of course, I had to try one! English fruitcakes are nothing like most popular commercial American ones. They are rich, moist, and laden with alcohol-drenched dried fruits; and, they are covered in decadent almond paste (marzipan) and thick icing. Moreover, British fruitcakes tend to be beautifully decorated and packaged. Interestingly, I since have learned that it is quite common for British wedding cakes to be made in this same fashion! After seeing so many fruitcakes being purchased by eager British holiday shoppers (and, presumably brides and grooms), I started wondering why Americans do not eagerly anticipate fruitcake during the festive season (or at any other time of the year either). So, why did American fruitcake degenerate into a cake that's as heavy as a brick and as tasteless as sandpaper? There is no definitive answer to this question. 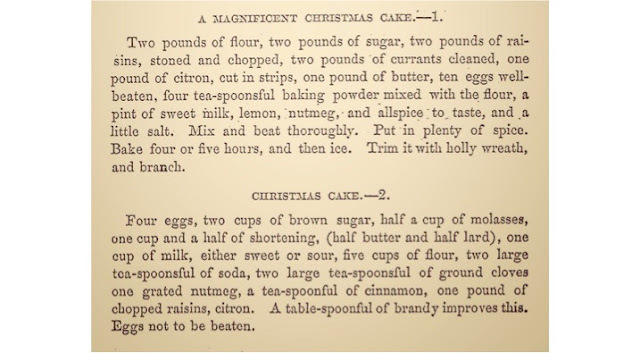 However, there are two possible explanations: 1) the era of Prohibition may have curtailed the use of spirits to flavor and cure the cakes to make them moist and delicious, and 2) commercial bakers during the days of Prohibition offered ready-made alcohol-free fruitcakes for sale and set a pattern for the next generations. I would love feedback from readers offering other possible reasons for the devolution of the American fruitcake. In an attempt to create a fruitcake Americans might actually want to eat, I am taking elements from two historic American fruitcake recipes to make a new recipe that I hope my readers will try and love. The first recipe is Martha Washington's Great Cake and the second is Black Cake. You can click on each link for more information about these cakes. 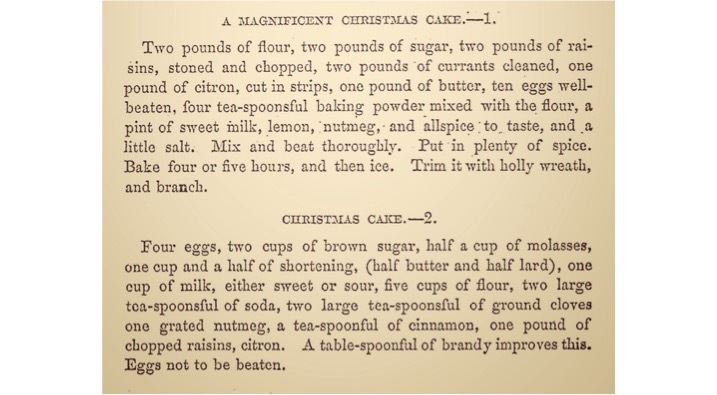 The recipe below is essentially the Martha Washington Great Cake with two major changes: 1) the addition of brandy-soaked fruit; and, 2) half of the granulated sugar has been replaced with dark brown muscovado sugar (true brown sugar). 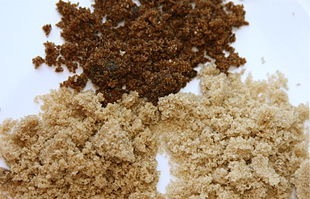 Note: most store-brand brown sugar is white sugar that has been coated with molasses; real muscovado sugar has never been refined to white sugar--its molasses occurs naturally throughout each crystal of sugar and so has a richer flavor. To make this fruitcake, you will need to plan ahead and start your cake 2-3 weeks before you want to serve it. There are lots of steps but they are all quite easy, so all you need is good organizational skills and a calendar with notifications to remind you to tend your cake! Now, Let's Make This Fruitcake . . .
1¼ pounds (20 ounces) dried fruit, such as currants, golden raisins, candied citrus peel (I do not like glazed cherries in bright green and red colors). Place the fruit in an airtight container and pour the brandy over it. Stir thoroughly and cover. Set aside in a cool, dry place for at least 12 hours, but longer if possible. 1. Heat oven to 350 degrees. Grease and line a 10" round cake pan with removable bottom. 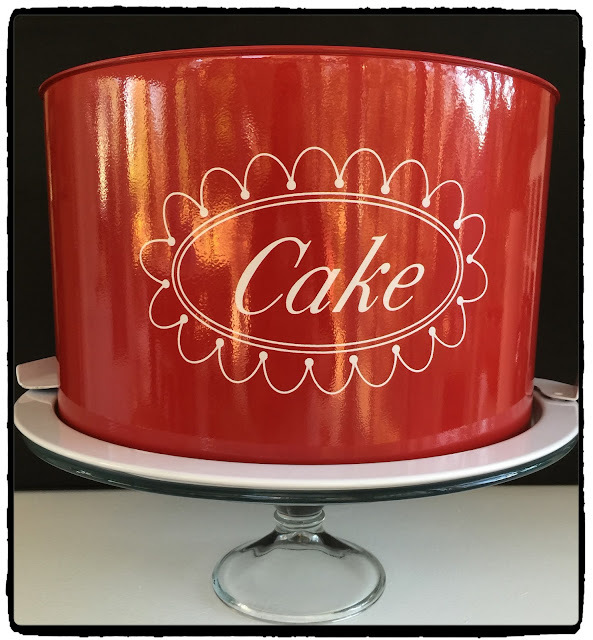 Place the cake pan on a parchment-lined baking tin. 2. In a medium bowl, measure out all but 1/2 cup of the flour. 3. Add the spices to the 3 1/2 cups of flour and whisk until well incorporated and fluffy. 5. Separate egg whites from yolks & set yolks aside in a small bowl. In another bowl, beat the egg whites to the foamy or “soft peak” stage. 6. In a large mixing bowl, beat the butter and sugars together using an electric mixer. 7. Slowly add the beaten egg whites, one spoonful at a time, to the creamed butter and sugar. Beat just until blended. 8. Add the egg yolks and beat to incorporate. 9. Measure out the wine & brandy and add them to the wet ingredients. 10. Add the flour and spice mixture to the wet ingredients. Beat until well mixed, but do not overbeat. 11. Then, add the flour-coated fruit to the batter. 12. Put batter into pan & place in oven. Bake for about 75 minutes if using one springform pan or 50-60 minutes if using two 9" cake rounds. Make sure a toothpick inserted is clean before removing from oven. Since oven temperatures can vary, you must monitor cooking time carefully. 13. When done, remove cake from oven & cool for about 10 minutes. Then move onto Step 3 . . .
1. Take cake out of cake pan and place bottom-side up on several large sheets of plastic wrap. 2. Poke holes in the cake using the wooded skewer. 3. Take the brandy and pour some over the cake. Use the pastry brush to spread the brandy. Keep pouring and brushing the brandy over the entire top of the cake. 4. Completely wrap the cake with the plastic wrap and place in the cake storage box. Store in a cool, dry room for about 1 week. 5. After the first week, follow direction #3 above again to feed the cake another 2 tablespoons of brandy. Then, follow direction #4 to store it again. 6. Wait another week and feed the cake one more time. 1. About 1-2 days before you plan to serve the cake (which should be after feeding the cake with spirits for three consecutive weeks), you are ready to finish it. 2. Roll out the almond paste or marzipan on a board dusted with confectioner's sugar to about 1/4 inch thickness. Cut it in strips to fit around the sides and top of the cake. Adhere the almond paste with melted apple jelly as a glue. This takes a fairly long time but is worth it as it adds a distinctive flavor. 3. Cover the cake with either homemade gum paste fondant icing, icing made from a store-bought gum paste fondant kit, or royal icing.